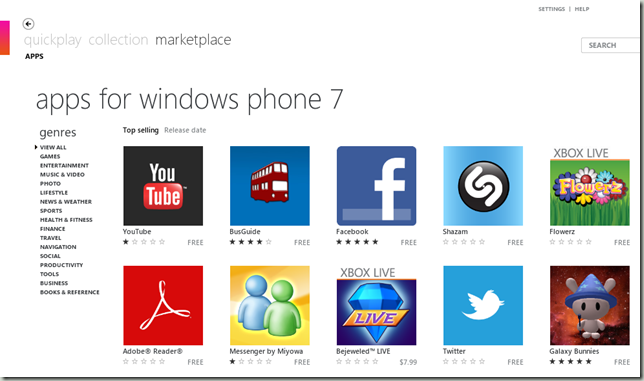 Windows Phone 7 is unlike is predecessor – Windows Mobile 5/6. Totally different. It is not using ugly forms, but their Metro UI. With a totally different UI, and operating system, Windows Phone, for its branding sake, should have severed its association with Windows Mobile. If there is one thing I hope they change, it is the name. It should have been called wOS or Zune OS. WP7 UI is good, and surprisingly, it did not copy from Apple’s iOS. WP7 gives me a very spatial, fluid feel, like every element is floating around somewhere. It is messy, yet organized and simple. 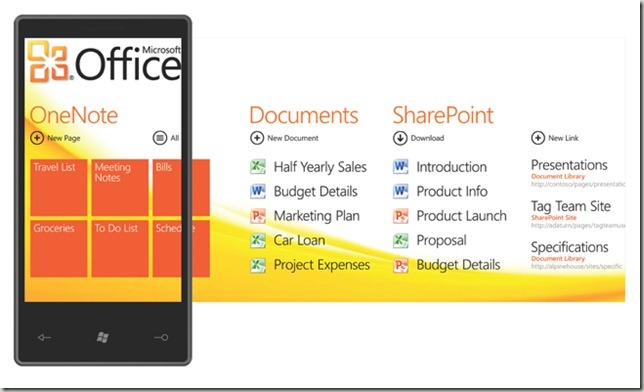 I have not used any mobile OS like that, so I must say Microsoft has innovated. For instance, take a look at the Office app below. You could have pan from screen to screen fluidly. The texts and components are also aesthetically “cut” off from the screen. Zune on Windows is excellent, maybe even better than iTunes. Apple iPhone became so popular because of iTunes. The desktop software makes browsing of apps much more convenient, and it magically sync your phone to computer. The Zune does everything that iTunes is capable of. Zune also supports more audio and video format. No longer do I need to convert my AVI to another format in order to play on my (i)Phone. And there is this thing call Zune Pass, that let you download unlimited music for $15 per month. That will be a very attractive service for music lovers. Many seems to have forgotten that Microsoft owns many technologies. It has Windows, the dominant desktop operating system. It has the best Office applications. It has MSN, the biggest instant messaging service. It has Azure cloud services. It has Windows Live Spaces for bloggers. It has Skydrive, for storing your photos. All these years, what it has been missing is a good mobile OS. Now that the final piece is delivered, everything can be linked up, and become even greater. It is obvious for a user to choose a Windows Phone when it provides an exclusive Microsoft feature. I have a sudden realization: I found square icon looking attractive, not worse than round corner icons. I know I have a changed opinion of Microsoft and its products. That is enough reason why WP7 will be successful and regain its market.